Control when your phone annoys you. Your phone’s Do Not Disturb features are handy — when we actually remember to turn them on. Sure, Vibrate and Silent can keep our phone from making noise, but they don’t make exceptions. Do Not Disturb will keep your apps quiet, but if your kids call you in the middle of the night because of an emergency, Do Not Disturb will let that call ring and wake you up. 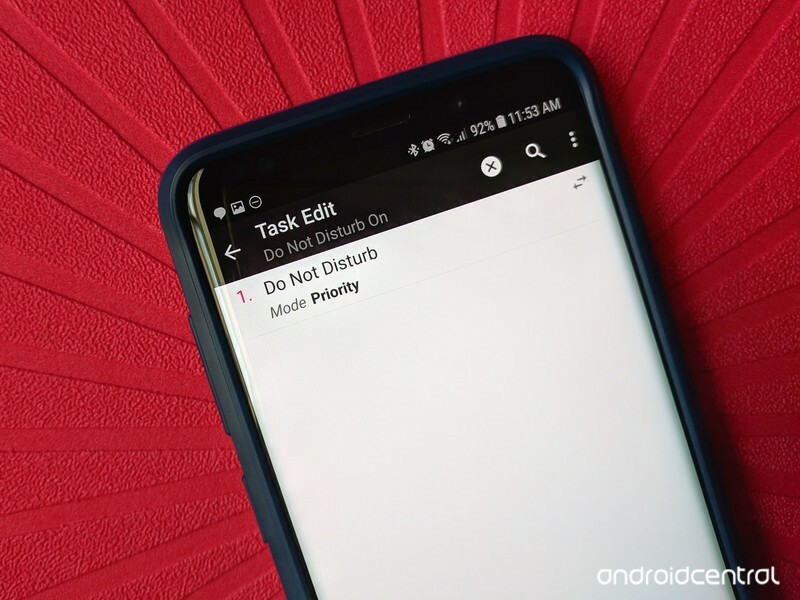 If you own a phone like a Google Pixel 2, you can schedule multiple rules that can turn Do Not Disturb on during your class periods, or during your Sunday morning mass, but on other phones like the Samsung Galaxy S9, you’re limited to one automatic rule for turning Do Not Disturb on and off. That’s where Tasker comes in. Tasker is a paid automation app that allows you to program and automate a wide array of actions and procedures on your phone using Tasks and Profiles. We can use Tasker to automate when Do Not Disturb turns on and off, allowing us to make more specific profiles and turn other things on and off when we’re doing it. The profile we’re making today is one of the most basic Tasker profiles out there, which makes it a great way to ease into the app and what it can do. Today’s project can be broken down into 2 phases: making the Do Not Disturb On task, and assembling Do Not Disturb profiles that can activate the Do Not Disturb task automatically. Tap Tasks in the top tab menu. Tap New Task (the floating action + button in the bottom right corner). Title your task. I suggest Do Not Disturb On, so you know what it does. Tap the checkmark next to the new task’s name. Tap New Action (the floating action + button in the bottom right corner). In the Select Action menu, tap Filter. Type in do. The only action that should be left in the menu is Do Not Disturb. Tap the Do Not Disturb mode you want. None will not allow anything to disturb you, while Priority will allow Priority calls or texts to get through. Tap Play in the bottom left corner to execute the task and see if it works. A green dot should appear next to the Do Not Disturb action, signalling the action was executed. If a Do Not Disturb icon appears in the notification bar (it may be to the left or right side of the bar depending on your device), your task works. If your task works, tap the Back arrow in the top left corner. Adjusting your screen timeout so that your screen stays on for less time with the “Display Timeout” action. Turning on or off Bluetooth or Wi-Fi with the “Bluetooth” or “WiFI” actions. Adjusting your ringtone volume with the “Ringer Volume” action. Each of these actions, like the Do Not Disturb action, will revert back to their previous setting once the profile is over. If you add actions besides these, you’ll need to test them to see whether they require an exit task at the end of the profile to set them back to their previous state. If they do need an exit task, follow steps 3-13, setting Do Not Disturb to All and setting your other actions back to the desired state. Now that we have our tasks, it’s time to make a profile that will trigger them. Profiles trigger tasks based on Contexts, such as time and date. Tap Profiles in the top tab menu. Tap New Profile (the floating action + button in the bottom right corner). In the First Context menu, tap Time. Scroll the From time to the time of day you want the profile to start. Scroll the To time to the time of day you want the profile to end. Select your Do Not Disturb On task. Tap the back button one more time to exit Tasker and save the profile. Profile changes won’t be acted on by Tasker until you leave the app. Long-press the time context on the left side of your Do Not Disturb profile. Tap Add to add another context. If you want to trigger your profile based on day of the week instead of day of the month, tap Month Day to open a drop-down menu. Tap the days you with to activate the profile on. Note: If you have setting an overnight profile, like 11PM to 6AM, adding a Day context means that the profile with fire during the hours on those days. If a 11PM to 6AM profile has a Monday to Friday Day context, Do Not Disturb will be active 11PM to 11:59PM on Friday night, but will deactivate at 12AM Saturday morning. After trying your hand at some custom Tasker Do Not Disturb profiles, play with the app some more! It can do a million things, especially once you start getting into the many, many third-party plugins available to Tasker that can help you do the impossible, like using Google Play Music as your alarm clock.